When you look at a chicken, the words hardy and durable may not be what comes to mind. And for that reason, we tend to go a bit overboard when it comes to their care. Even if you live in the blistering cold of the north, keeping chickens is easy to do. 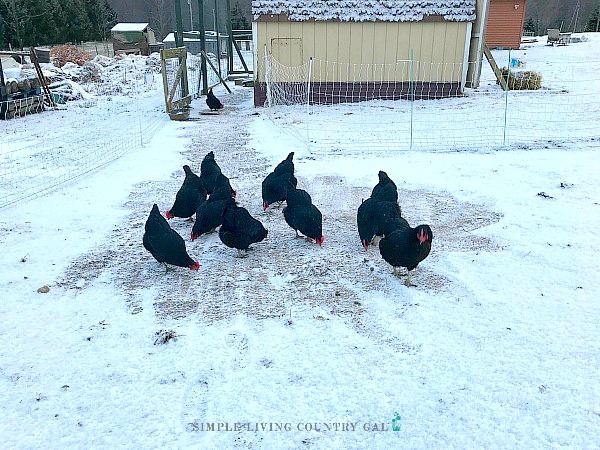 More often than not, chickens can tolerate the cold pretty well but with a few tips, I can show you how to keep chickens warm in winter without electricity. Heat lamps are a big buzzword for the new chicken owner and most will purchase several when starting out. Other than using them to keep your baby chicks warm I would keep them locked away. I tried heat lamps for the first few years we had chickens and let me just say it did more harm than good. When you have a heated coop, even if only at night, your hens become dependent on that heat and therefore never really get the durability they need to withstand the frigid wind chills that come with really cold winters. When a local fire in our area was started by one of these heat lamps, destroyed a barn and most of the animals inside I stopped using mine and never looked back. The funny thing was that my hens were actually HEALTHIER without the heat! They grew thicker downy feathers, their combs were a deep rich red, and they laid eggs like nobody’s business. The trifecta of a healthy and happy chicken. Let’s chat about downy feathers for a bit because they are the key to keeping your chickens warm which. Those feathers help to lock heat in and provide a protective layer from the elements. The chickens will fluff up their feathers to keep warm and for this reason, I do not recommend chicken sweaters that are really popular right now. Now, with all of that being said, there are still quite a few things you can do to help your hens stay warm even in the coldest of temperatures and yes, even if you do not have electricity in your chicken coop. 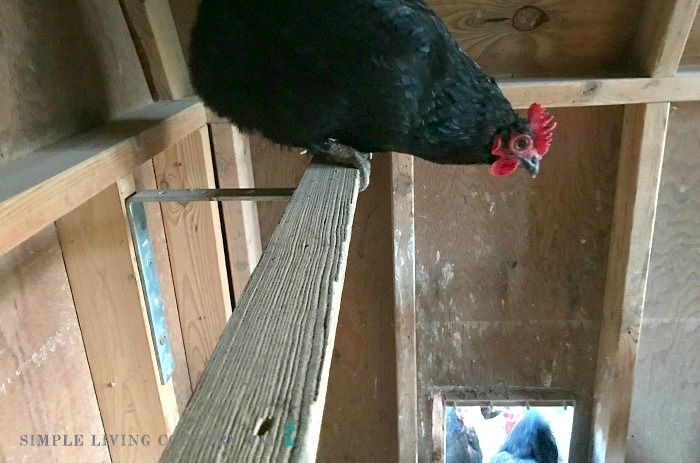 If you clean out your chicken coop each fall before the winter hits, that is the perfect time to do a chicken coop inspection. Check for any holes in the walls or floors that may let in drafts or worse predators. Seal those cracks up and help to keep the frigid air out on those cold winter nights. Now is the time to ensure you have a good winter coop design that will keep your hens warm and safe during those long cold months. We house our hens in an old shed that we converted into a chicken coop. This not only keeps the hens off of the cold ground but has a ventilation window at the peak that allows for air flow. Yes, there is a difference. Drafts are bad whereas ventilation is good. Drafts are cold and piercing and can do harm to your flock. Ventilation is filtered so it enters the coop slow and steady and keeps the coop filled with fresh clean air. You do not want drafts but you do want ventilation. Before winter hits you will want to lay down a really good layer of bedding for your hens. Wood chips, sawdust, and straw are all great to use. I suggest laying down a good foot deep of bedding, especially if you live in a really cold climate and more if your chicken coop does not have a separate floor to the ground. Chickens do not have feathers on their legs or feet so standing on the constant frigid ground can be incredibly harmful. By providing them with a good think ground cover you will keep them warmer and in turn, healthier. I like to put a few bales of straw inside of the coop (do not use hay) that I place in front of the doors. This gives the chickens a sort of cocoon that they can eat and drink within a bit more comfortably. They also like to roost on the bales and this will help them to stay off of the cold ground if your coop does not have a floor. As the winter progresses those bales tend to get a bit beat up but don’t worry. Since you used straw and not hay you can add those partially composted bales right to your garden come spring. Not sure of the difference? Let’s go over it quickly. What is a straw bale? A straw bale is made of up stalks which is the wasted product of wheat and is used as bedding for livestock. It contains no seed heads or seeds so it can be safely used in gardens as mulch or as winter covering. What is a hay bale? A hay bale is cut grass or alfalfa and used to feed livestock. It contains every part of the plant including the seeds. If you use this in your garden beds you will be adding a load of seeds to your beds including weed seeds as well. Trust me on this, I have done the legwork. Hay in a garden is a no-no and will only cause you to have to weed more than you ever imagined. Final word to remember is you always want to make sure you are using straw when growing anything and hay when feeding anything. I find that when the mornings are really cold, my chicken’s water is usually frozen solid. To fix this I bring out a jug of hot water to start the day off. This will usually stay liquid until I gather eggs around 1 pm where I give them a fresh batch. Then finally once again at the evening feed. Ninja tip: If you live in a cold climate I would not suggest a chicken waterer like this one. They tend to not withstand the elements and the abuse repeated frozen water can make. Instead, try these rubber feed bowls. They are durable, inexpensive and can be used for feed, water, or mash. I know this sounds like a lot of work but really it isn’t. All you need is a cleaned out empty jug and each time you are going out to the coop bring a fresh batch of hot water along with you. If you are going out anyhow, it is really no extra effort on your part and your hens will love you for it! I also like to give warm mash in the morning too. Just pour some hot water into a feed bowl and add their feed. 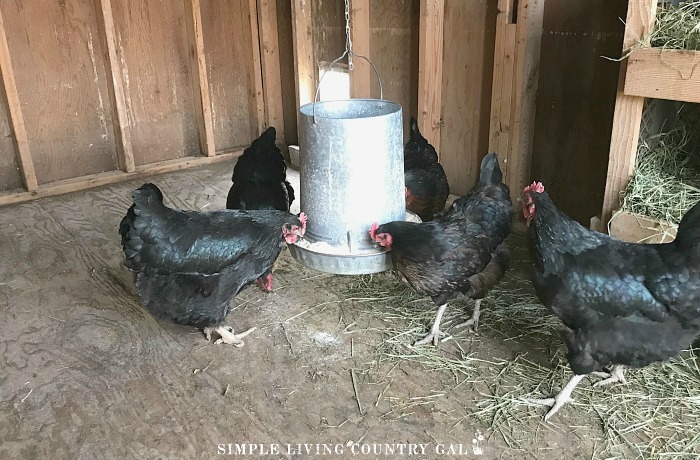 I love these rubber feed bowls and use them all over the homestead. Do not do this with pelleted feed since it does not react well to water. You don’t even need to mix it up, the hens will do it as they are eating it. Usually, when I do this they are eating before I finish adding the feed to the water, they love it that much. How to keep chickens warm at night. I think night time care more than anything causes us to overdo it with our chickens. To keep your hens warm at night you only really need two things. First a good sturdy coop with little to no drafts. Like I talked about above, you will want to inspect things in the fall so you have time to button up the hatches before winter. Second a good sturdy roost that allows for plenty of room for your entire flock. When we first started out with chickens I was under the impression that they needed a rod of sorts to roost on. I believed that chickens wrapped their feet around a roost to sleep just a like a bird does. It wasn’t until years later I found out that I was wrong. Hens actually prefer to be flat-footed when they sleep and even more so in the cold season. When they are sitting flat footed they can sit down completely which will allow them to cover their unprotected legs and feet with those warm downy feathers. A good rule of thumb is to build a roost that is at least 2 inches wide. 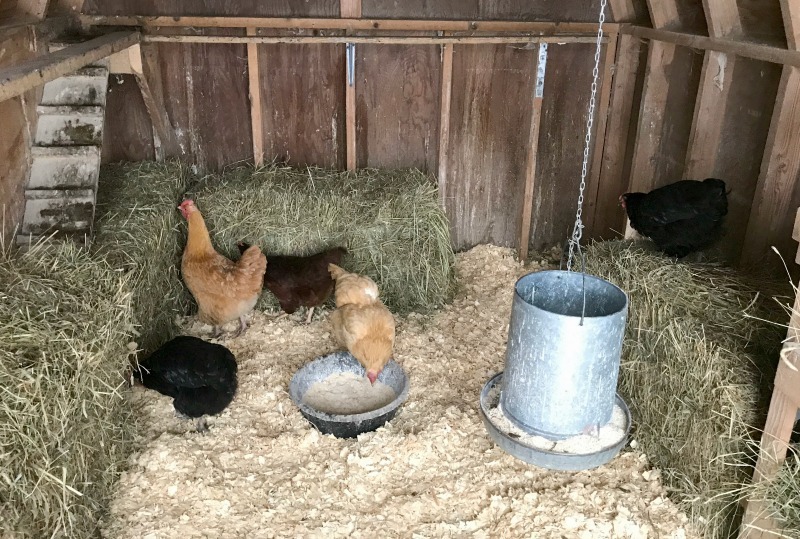 After many attempts at different styles of roosts, Hubs and I found one that we absolutely love and is perfect for anyone that has a smaller coop and needs to conserve space. READ: CHICKEN ROOSTS – EVERYTHING YOU NEED TO KNOW AND MORE! Just like with goats, chickens warm up when they are digesting their food. For that reason, it is better to have a continuous feeder going at all times. I have a metal feeder and it has lasted for years and works amazingly well. Not sure about using a continuous feeder? Sure, you are spending a bit more in feed doing things this way but our job is to give the best care to our animals and a healthy chicken is worth the money of the additional feed especially if you want eggs all winter long. You can also sprinkle a little scratch before closing them up for the night. Scratch takes a bit longer to digest and will help to keep them warm while they sleep. Solar powered chicken coop heater. 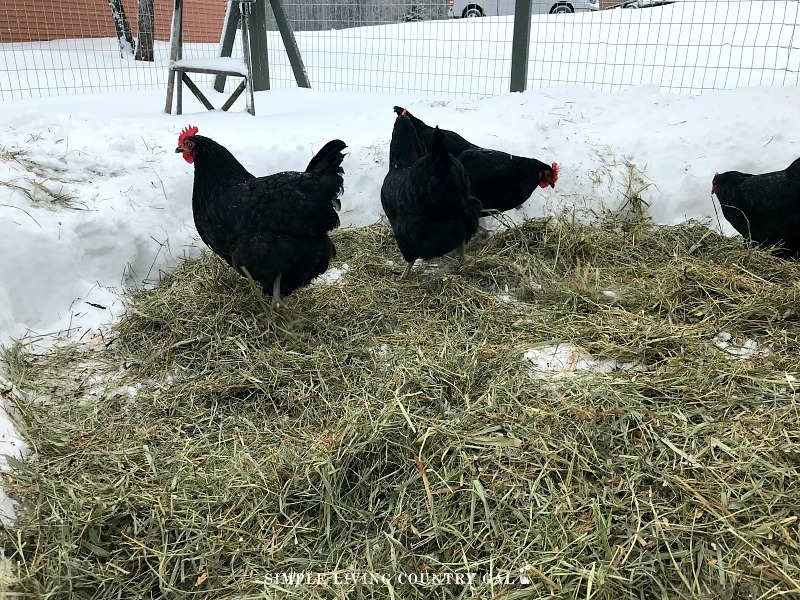 If you live in a dangerously cold climate such as Northern Canada or Alaska then you may need a little extra help to keep your chickens safe. This solar power chicken coop heater is not one I have tried myself, but the reviews say it does work and may be something you want to look into further. These heaters are not meant to heat the entire coop but to instead offer a warm spot in the coop for your chickens to enjoy. The best way to help your chickens to deal with the cold of the snow is to create a covered walkway of sorts for them. This can be done either by scattering hay or straw onto the ground, by placing logs for them to perch on, or sprinkling sawdust or woodchips. Begin by shoveling an area in your coop and then lay some straw down for them to walk on. You can also sprinkle some scratch onto the straw to encourage to come out. Once they are used to a pathway they will use it more and more. Getting your hens used the winter weather will get them out of the coop and in the fresh air. How to keep eggs from freezing in the winter. If you are new to chickens, this might just be a bit surprising to hear. Yes, eggs can and will freeze if it is cold enough outside. And a frozen egg is probably not an edible egg. To fix this make sure to collect eggs several times throughout the day. Can I eat a frozen egg? Sometimes you can and sometimes you can’t. I know, not what you were hoping to hear? No worries…let’s go over things a bit to clear it up. If the egg is frozen and not cracked then place it in the refrigerator so it will thaw slowly. Once thawed it should be just fine to eat, but inspect it thoroughly for any cracks to be sure. 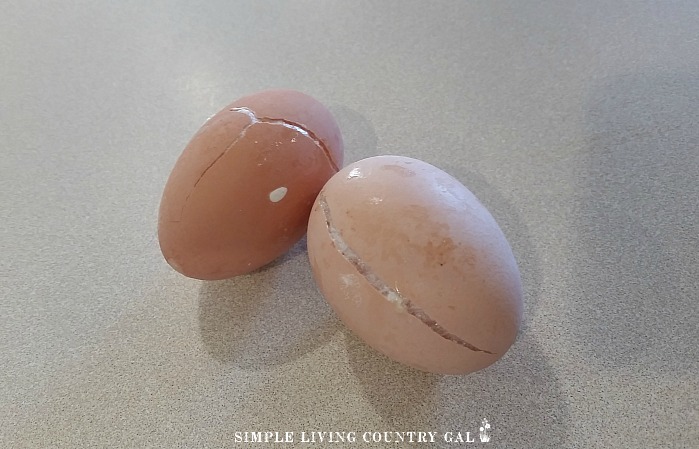 If the egg is frozen and just cracked (nothing is oozing out) then thaw again in the fridge and use right away. If you notice the membrane is dirty, you may want to be safe and toss it. If the egg is frozen, cracked and oozing then to be safe I would toss it. If you have pigs you can always give the eggs to them. Yes, pigs LOVE raw eggs! Finally, can chickens stay outside in the winter? As long as you have a warm secure and dry coop for them to get away from the elements, then, by all means, they can. 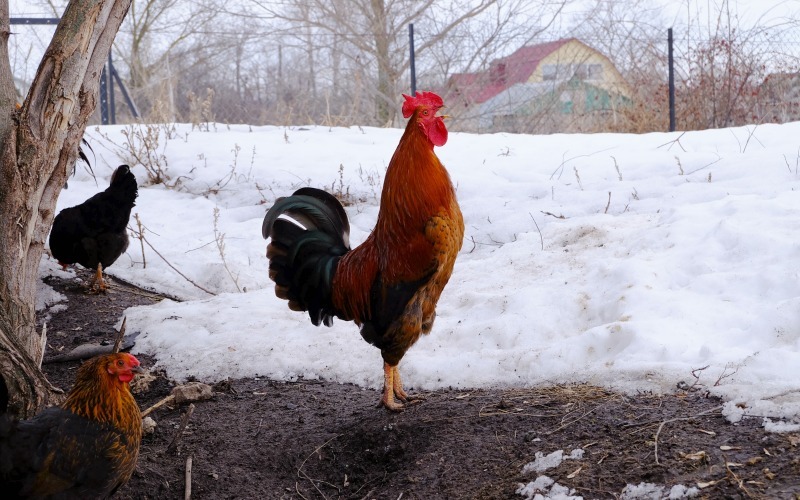 Chickens can be very hardy if given the chance to adapt to weather changes gradually. Allow them to have continuous daily access to the outdoors year round so they can adapt to any weather changes slowly. This will hardy them up as well and acclimate them so they can withstand the frigid nights of winter. What tips do you have on how to keep chickens warm in winter without electricity? I enjoyed your article about chickens. Thank you for this thorough list of tips! I live in Montana, where summers are scorching hot, and winters are brutally cold. This is my first attempt at raising chickens, and although they are for eggs, I want to make sure they are treated humanely. I have read that (proper) ventilation in the winter is one of the most important factors in a coop design, and am working on building one while my chicks are still in their brooder. You sound like you will be an amazing chicken owner, lucky hens! my coop has a window of chicken mesh in it, quite large. Do I need to close it off in winter? Ive seen a lot of coops don’t have mesh windows and are in darkness when closed. I don’t want them to freeze. If you are worried about the dark, you can cover it with plexiglass. It is inexpensive clear plastic that will help to keep your coop a bit warmer.